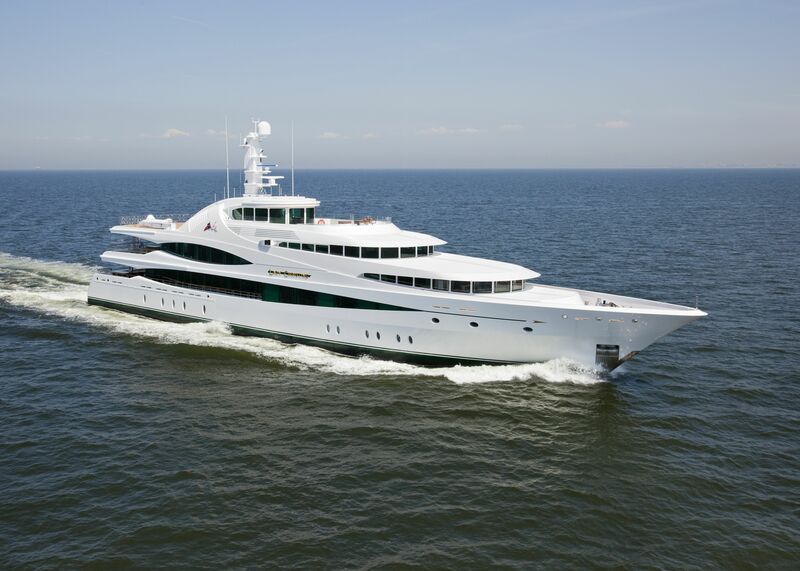 Royal Van Lent has delivered the 68.00m (223’1”) Feadship Lady Christine to her owners. Built for experienced yacht owners, Lady Christine features a radical different exterior design from De Voogt Naval Architects and a remarkable debut superyacht interior from British designer Rodney Black. The owners are so delighted with their new acquisition that they have agreed to showcase her to an invite-only audience at the upcoming Monaco show. The beautiful exterior profile of Lady Christine combines a wide range of modern and contemporary features with signature Feadship influences. A wealth of windows, including the distinctive ‘fish-eye’ section aft, hints at the vast amounts of light that bathe the yacht’s interior. Enormous attention has been paid to ensuring continuity of detail, including adding ‘false’ windows to extend the lines. A lovely infinity pool with water flowing over the stern from the swimming pool aft on the main deck adds to the spectacular first impression on all who see Lady Christine. 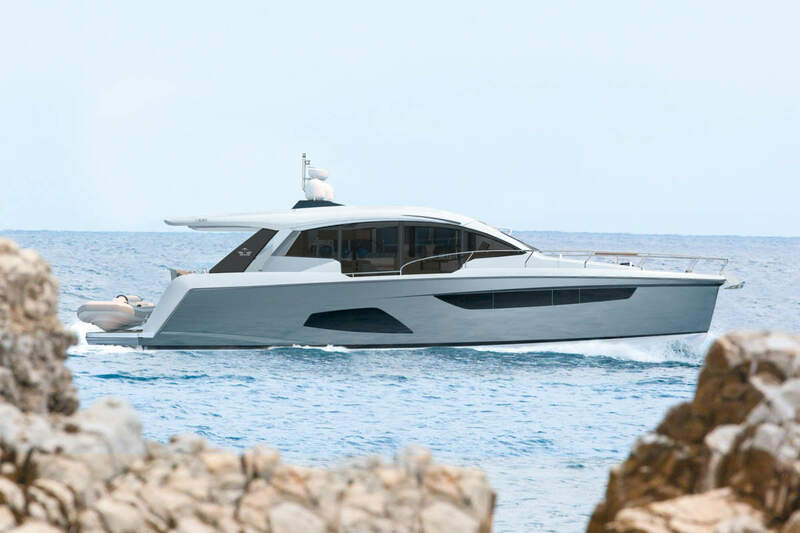 The overall shape of the yacht is defined by the decision to create an entire owner’s deck, including a private observation lounge above the wheelhouse. This required a split-level approach that significantly enhances the yacht’s volume. From the sophisticated Key West meeting room on the sun deck to the immense storage options on the tank deck, every inch of this Feadship has been optimized. Highlights of the elaborate interior include a cinema for eight on the lower deck and the exceptional bar and dining room on the main deck. The latter features full-height windows either side, which slide back to open up the side decks. Large platforms slide out from underneath the floor to both starboard and port to create a unique double balcony and increase the beam of the deck in this spot to 15 metres. The sensational main entrance opens up to a spiral staircase and the first of the many examples of magnificent marquetry and inlay work that are the hallmark of the interior design. The full-size images here and on the bridge deck lobby have been created using many kinds of woods and stains in order to portray aspects of the owners’ lives and places they love to visit. The yacht’s overall interior style takes its cue from an early form of art deco, translated into an entirely original and multifaceted design in its own right. Lady Christine has luxurious accommodations that bring out the best of expansive space available. The owner’s deck includes a full beam stateroom, two separate studies, full beam observation lounge and gymnasium. Eight guests will enjoy the four very large staterooms on the lower deck, while the nineteen crew members have also been given the very finest quarters and facilities. This is yet another great example of the Dutch Super Yacht builder leading the way in classic elegant design coupled with superb use modern materials and technology. Content and picture courtesy of Feadship. Great super yacht from feadship once again and hopefully i will get a glimpse of her when i go to the Monaco Yacht show, great review WSB keep them coming.